This is a record of the family of Damiano and Oliva Genetti. They were both born in the village of Castelfondo, located in the Dolomites of the Austrian Alps. 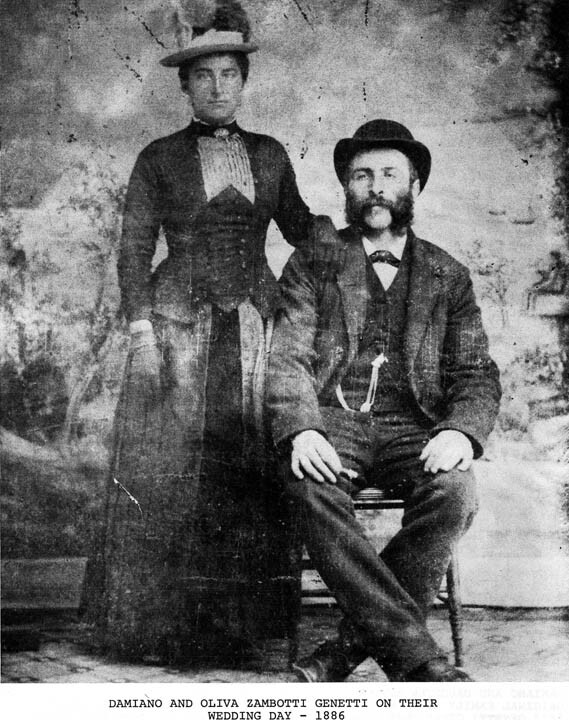 Damiano and Oliva came separately to the Hazleton area in the early 1880’s. In 1886, they were married in Scranton, Pennsylvania by Bishop William O’Hara. In 1887, their first child, Leon, was born in the Hazleton area. In 1888 Damiano, Oliva and their infant returned to the Genetti homestead in Castlefondo. Upon returning to Tyrol, Damiano performed his required military service as an officer in the Austrian army. All other children were born in Castelfondo during this era. In 1923, Damiano turned the business, two stores and the butcher shop, over to his four sons and returned to Castelfondo. All the children and Oliva remained in Hazleton. Damiano returned to Hazleton from time to time to visit. He left the U.S. for the last time in 1934. Following the death of Oliva in 1938, Damiano had plans to return to Hazleton in 1939, but the outbreak of World War II prevented the visit. He died in Castelfondo at the age of 87, five months before the war ended.